ITIL is used by millions of professionals globally. Businesses are built on ITIL®. Every year, organizations invest heavily in adopting and adapting ITIL® into their business practices and upskilling their workforce with ITIL® qualifications. Extensive research by AXELOS, involving a diverse group of stakeholders, has consistently shown that ITIL® is fundamental to businesses, enables transformation and helps organizations realize value. ITIL® 4 has been designed to help organisations meet the increasing demand from the current complex digital environment. The new scheme is aligned with ITIL® v3 and has been streamlined to encourage conversion beyond ITIL® foundation level. Shows that a candidate’s certification/skills are up-to-date. Axelos has created recommended routes that allows candidates to transition while still gaining the skills and knowledge needed to understand the core concepts of ITIL® 4. ITIL® 4 Service Value System has been announced with a much defined protocol suited for today’s Service Management System. The ITIL® SVS describes the inputs to this system (opportunity and demand), the elements of this system (organizational governance, service management, continual improvement, and the organization’s capabilities and resources), and the outputs (achievement of organizational objectives and value for the organization, its customers, and other stakeholders). We understand ITIL® 2011 focused largely on the process and procedures of the entire Service Management System. Instead ITIL® 4 enhanced the spectrum by including the guiding principles which governs the policies and makes it aligned with todays need of Agile and Devops. ITIL® 4 as a framework has come across some major changes which makes it much more dynamic to work with Agile and Devops. Some of the interesting alignments have been shown below. We are in a time of unprecedented change, known as the ‘Fourth Industrial Revolution’. It is characterized by the digital transformation of our world and the unavoidable interaction between humans, digital technologies and physical assets. It is an increasingly fast-paced and complex environment, requiring organizations to be more agile, better equipped to adapt what they do, and ready to adopt new ways of working to succeed. ITIL® 4, through its framework, helps organizations to connect and align these different challenges that are relevant not only to ITSM professionals, but also by a wider range of professionals working in the digital world. ITIL® 4 expands on previous versions by providing a practical and flexible basis to support organizations on their journey to the new world of digital transformation. It provides an end-to-end IT/digital operating model for the delivery and operation of tech-enabled products and services and enables IT teams to continue to play a crucial role in wider business strategy. ITIL® 4 supports the existing investment that people and organizations have made in ITIL® , as it is an expansion on the existing framework. That investment is protected because ITIL® 4 provides a practical and flexible transition that helps organizations adopt the new ways of working brought by the modern digital world. ITIL® V3 Foundation: If a candidate has taken only ITIL® V3 Foundation, then the recommended approach is to take ITIL® 4 Foundation in order to able to transition to the new scheme. ITIL® V3 Intermediate: End-learners holding a low number of credits beyond Foundation have two recommended options to transition to ITIL® 4 dependent on what they want to achieve in the scheme. Option 1: They are encouraged to take ITIL® 4 Foundation and a further module in their preferred area of interest, becoming an ITIL® Specialist, Strategist or Leader. Option 2: They are encouraged to achieve 17 credits from ITIL® V3 to become eligible to take the ITIL® Managing Professional transition module. ITIL® V3 Expert: If an end-learner has achieved ITIL® V3 Expert, they can take ITIL® Managing Professional transition module to achieve the ITIL® Managing Professional designation. After achieving the ITIL® Managing Professional designation, if the end-learner is interested in pursuing the ITIL® Strategic Leader stream, they would only need to complete the ITIL® Leader Digital & Strategy module. Once they have completed both streams they are eligible to move towards ITIL® Master. ITIL® has led the ITSM industry with guidance, training and certification programmes for more than 30 years. ITIL® 4 brings ITIL® up to date re-shaping much of the established ITSM practices in the wider context of customer experience, value streams, and digital transformation, as well as embracing new ways to working, such as Lean, Agile, and DevOps. There are no prerequisites for this course, although a basic knowledge of Service Management concepts will be helpful. To assess whether the candidate can demonstrate sufficient recall and understanding of the ITIL® 4 service management framework, as described in the syllabus below, to be awarded the ITIL® 4 Foundation qualification. 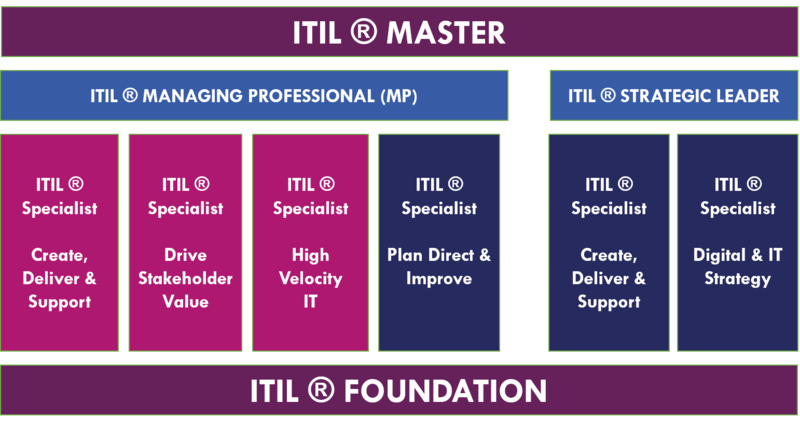 The ITIL® 4 Foundation qualification is a prerequisite for the ITIL® 4 higher level qualifications, which assess the ability to apply concepts understanding of the relevant parts of the ITIL® framework in context. Existing ITIL® qualification holders wishing to update their knowledge. The exam is closed book with 40 multiple choice questions. The pass score is 65% (26 out of 40 questions). The exam duration is 60 minutes. The exam can be taken in two formats: paper-based or online. ITIL® 4 is registered trade mark of AXELOS® Limited, used under permission of AXELOS® Limited. All rights reserved. The Swirl logo™ is a trade mark of AXELOS® Limited, used under permission of AXELOS® Limited. All rights reserved.